Holly, like Philip Marlowe, cannot be bothered to break his moral code for money. He has stayed in this city licking up the scraps of his literary celebrity for one reason, his own romantic spirit. Whether his blossoming, but unrequited, love for Anna, his devout belief in Harry’s inherent goodness, or his romantic delusion that he is a detective looking for the truth, it is Holly’s romantic nature that keeps him in Vienna. Holly could likely be somewhere else, making a living without a life on the line, but like Marlowe, he is a romantic living in a world that isn’t. In his introduction to F for Fake, Orson Welles quotes the great magician Jean Eugène Robert-Houdin, who said “A magician is just an actor. Just an actor playing a magician.” In that sense, perhaps, a detective is just an actor too, playing a detective. And Holly, a romantic novelist playing a detective, may be even further from reality, living on a moral code that stifles him but not those around him. And he’ll soon come face to face with that realization. 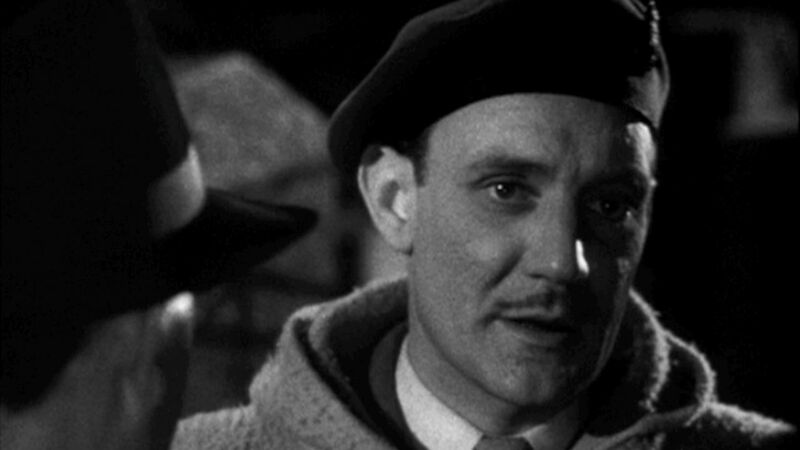 For now, though, let’s turn back to the frame itself, one that displays only the corner of Holly’s hat, but is dominated by Calloway looking dreamily off camera right, his open expression surprisingly welcoming when compared to the scowl he has customarily worn throughout this film. I made my first note on him for my security police files: “In normal circumstances a cheerful fool. Drinks too much and may cause a little trouble. Whenever a woman passes raises his eyes and makes some comment, but I get the impression that really he’d rather not be bothered. Has never really grown up and perhaps that accounts for why he worshipped Lime” (Greene,The Third Man, Penguin Books, 1949, pg. 13). Though this Calloway lives in a different world, a literary world where Holly’s name is Rollo, his description seems to hold water when compared to the cheerful fool we can now see reflected in Calloway’s eyes. Our literary Calloway is a much more introspective figure than the harsh paper-pusher we see on the screen. His inner monologue seems much more aware than Holly’s, focusing not on the trivial squabbles of Americans in Vienna, but on the tragedy that is the city itself, which he calls “the smashed dreary city of Vienna.” Somehow this film has managed a remarkable switch in perspective. Although we’ve been saying all along what a fool and blowhard Holly is, we’ve never truly had any alternative to his point of view. Now, all of a sudden, his perspective will pull a full 180. Holly, finally convinced by Calloway to open his eyes and drop his belief in the infinite power of childhood friendship, has begun to entertain the idea that Harry is indeed a criminal, a brigand, maybe even “about the worst racketeer that ever made a dirty living in this city.” And not only that, but our view, which has followed Holly’s eyes to the hard shadows stalking him at every corner, has suddenly pulled out to reveal the whole workings of this dirty city. Normally, a paradigm shift of such monumental scale would necessitate a narrative twist, a tactic which fails almost as often as it succeeds, but what is so remarkable about this film is that Calloway has been telling us this story all along. Now, all of a sudden, we—and Holly—believe it. 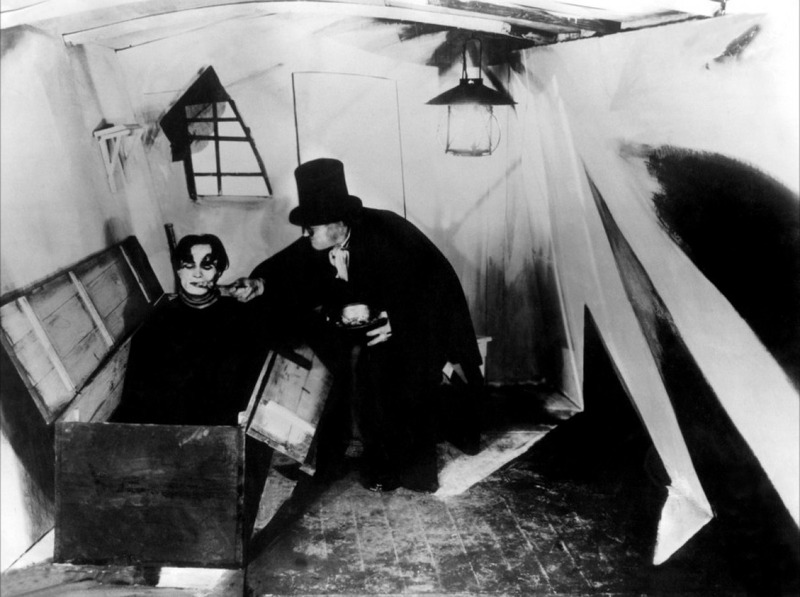 Caligari’s Cesare sleeps in this coffin by day and commits murders by night. Last week, Matt delved into the action going on in this scene, the exhumation of a body, drawing comparisons to the countless bodies exhumed in The X-Files. But while the body is important in this scene, we never see it, except—again—reflected in Calloway’s eyes. We watch him see the body after the coffin is lifted and thrown open. But coffins themselves, even without bodies in them, occupy a terrifying position in horror cinema. Whether a vampire like Nosferatu (1922) or a creature like Cesare in The Cabinet of Dr. Caligari (1920) the coffin has never brought with it good connotations. And like Jonathan Harker in Dracula, it may be even more terrifying to find the coffin empty, and to know that what might have been in it is lurking somewhere unknown, maybe even somewhere close by. Our coffin, empty to our camera eye, carries with it all of the creatures that have occupied coffins in the past, and even when Calloway identifies the body, he knows that somewhere far off, Harry is alive.